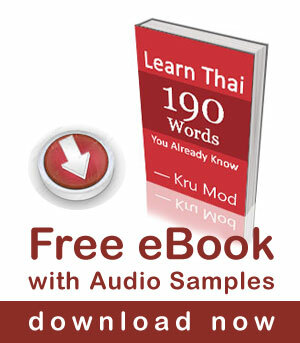 I would like you to practice your Thai listening skills. I couldn’t think of anything to tell so I decided to tell a short story of my life, all in Thai language! My first name is Adjima, my last name is Thaitrong. And then move to NaKhon Si Thammarat. NaKhon Si Thammarat is in Southern Thailand. I grew up in NaKhon Si Thammarat. And then moved to Bangkok to study in the university. I have been living in Bangkok for 9 years now. I used to work in an audit firm for about 2 years. I didn’t like it; I felt the audit job wasn’t fun. So I changed my job. I went to work at an accounting firm for about one year. I felt that it wasn’t fun, it was boring. I felt I didn’t like the working life in the office. And then I spent time to figure out what I wanted to do for about 2 months. I thought I liked talking to people, I like to use languages. So I thought of teaching Thai language. I started making videos to teach Thai language in YouTube two years ago. There were students started to contact to have lessons with me. Now I really enjoy teaching Thai language. Just found this, thought “this is great!”, but when I tried to play the video, I see a message that tells me the Youtube account for this video has been “terminated due to multiple third-party notifications of copyright infringement”. Who are these moronic third-parties, and how can I exterminate them? How on earth can you infringe you own copyright? Ridiculous! Hi Mod, I want to load my mp3 player with Thai language for listening practice. What are some popular free podcasts in Thailand? I don’t want Thai language learning podcasts. I want podcasts on various topics that Thai people listen to. Thank you so much for all your lessons ! Very good. Short dialogues like this are just what I need. More please. These are really cool videos, I especially like the fact how you write the Thai script and use the phonetics as well. The great thing about using video here on your site and youtube is that people can do it at their own pace which is great for me as I work during the day. Anyhow, this is one of the best I have seen and I have seen a lot. Congratulations and Thank you Khun Mod. Sawatdee ka, thank you for watching my videos. I am afraid I don’t understand your question, could you clarify please? Hi kru Mod , in fact in you’re last vidéo in the sentence you use ” LONG ” before “you tube” and” long” in thai is go down i believe but in this sentence what “LONG” means ? Thank you for your patience KWAAM OT THON !!! Ex. ลงรูปในเฟซบุค /long ruup nai Facebook/ upload photos to Facebook. ลงวิดิโอในยูทูบ /long wi-di-o nai YouTube/ upload a video to YouTube. Thank you Mod !See you soon may be in bangkok when i’ll come. Hi Mod. Thank you so much for this video. I think it is one of your best ones so far. I am an intermediate learner, so I like to be able to practice listening and hearing real Thai talk. I hope you make more videos like this one. Hmmm… If you are still taking lesson requests I would love, love, LOVE it if you made a video explaining what is probably the most used and also the most complicated word in all of Thai language… what could it be?? haha… maybe you can guess…. … It is ก็. Ohhhh… how this word still confuses and frustrates me after four years of study. It seems to appear in the strangest of places and almost randomly. No one has ever been able to explain it’s use to me in a way that I can understand. Usually Thai will tell you that it means “also; too; as well”, but this does not always explain how to use it, when to use it and when not to use it. Hi khru Mod, thanks for this wonderful vdo. thanks. very helpful, very well done. Happy can learn more about you. Kwarp khun khrap. Kop-jai sam rap VDO na kap. Tee-nee geng maak sam rap fook-fon gaan fang. David dai-yin kham “lai awk” tee video kawng kun. Rian kham nee aa thit leao pra waa ngan kawng David lai-awk raeng-ngan yer yer.